The first part is the performance of the Kiyanaa vital and perpetual exercises, that consists of sunrise salutation movements, eye exercises, dance of the hands, selection of callisthenic, disciplinal exercises (“Varzish Baastaani”,ancient athletic), the dance of the feet, and asymmetric trembling movements. These are daily exercises that are useful for keeping the body in well-being, good shape and worthy to be able to do the Sama'a. 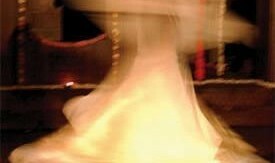 Javad Tehranian teaches vital exercises, infinity respiration, eye exercises, and body discipline, as well as symmetric and asymmetric movements by the method of divided attention, inner development, rhythmical contemplative movements, and the enchanting, euphoric Sama'a dance. Kiyana, meaning “the origin”, is a system of movements and internal work coming from ancient Persia; it relates to the education and the complete development, the unity and oneness of the body, mind and spirit, cleanliness, purity, equilibrium, power, health of body, tranquility in the mind and subtility of the soul of human beings. The ceremony of Sama'a that is presented apply in two parts. The first part is the performance of Kiyana movements, the daily exercises that are useful for keeping the body in well-being, good shape and its relation with the mind. Those are necessarily exercises for preparedness, fitness, unity and the connection of body, mind and spirit. And with the rhythm they involve causes human reach to a spiritual accuracy and unite one with a power beyond of what one may be. The geometrical figures such as point, line, triangle, square, pentagon, polygon and circle that are presented during the first part are an aspect of moving without interruption from unity to multitude (from point to circle) and moving from multitude to unity (from circle to point) and each of these has mysteries and relations with numerical science and sacred geometry. The second part of the ceremony that is being presented is an aspect of a true Sama'a, in order to give the participants a description and an idea of what a real Sama'a may be like. In this manner according to the level of the state and the condition the present participations have arrive at, an aid from above may manifest and the imaginative faculty, get empowered from celestial world; the veil of separation get removed and a sight of the world of imagination may be manifest and the inner faculties may conceive the world of angles.